For those of you who haven’t taken advantage of the AliExpress.com, please do so soon because the coupon expires by 7/8 (midnight, so technically 7/9) or upon reaching the budget threshold (whichever comes first). After you redeem the Vendio2010 coupon, you’ll be issues five $20 coupons. You will then have until 12/31/2010 to activate and use those coupons. After you redeem the Vendio2010 coupon, you’ll be issued five $20 coupons. You will then have until 12/31/2010 to activate and use those coupons. As part of the Vendio acquisition, Alibaba.com (the parent company of AliExpress) and Vendio have paired up to give you up to $100 worth of free merchandise that can be ordered directly from AliExpress. This enables Vendio merchants to buy “sample” items of products that they may wish to source and is a great way to test out AliExpress. You can only get this offer by going to a special landing page and entering a Vendio coupon code. Once you do so, you’ll receive FIVE COUPONS worth $20 each. Each coupon is valid for any order more than $20 (no maximum). An order can consist of multiple items. The only catch is that you can’t use all five coupons at once, but you can place five separate, successive orders. 1. Log into your Vendio Account, or Sign-Up* for Vendio by clicking on the Get Started button. *Please note – This offer is also available to NEW Vendio account and applies to any Vendio account, even those with a FREE store or any other free Vendio product. So you can sign-up today to take advantage of this offer. 2. Click Here to go to the special landing page. 3. 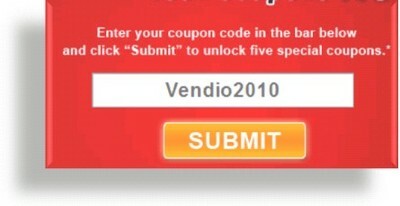 Enter the Vendio coupon code: Vendio2010 and click on the SUBMIT button. 6. Start Shopping! Click on the “Go To AliExpress” link or shopping cart icon. Each coupon is worth $20 and is valid on any order greater than $20. Therefore, to maximize the value of this you simply need to create an order that’s $20.01 or more. Keep in mind that because you have 5 coupons, you can place 5 different orders for up to $100 of free stuff! 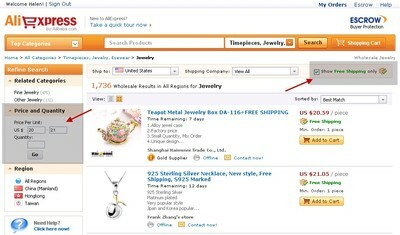 AliExpress has a great search function that enables you to find deals fast. 1. Choose a category or subcategory. 2. In the “Price and Quantity” search box, choose the value $20 and $21. Also select the “Show Free Shipping” box. This ensures that you’re only looking at items that cost between $20-21 with shipping included. 3. Find an item you want to purchase. Click on the “Buy Now” button. 4. You’ll then be asked to fill in your shipping information. 5. You’ll next be taken to the “Review Order” page. Please note that the coupon will not be applied until the next step. 6. Next you’ll see the “Payment” page. Here the coupon will be applied. As you can see in my example, I only need to pay the balance of $0.62. You can pay via PayPal, credit card or bank transfer. Have questions? Drop us a comment below. This entry was posted on Thursday, June 24th, 2010 at 4:15 pm	and is filed under Vendio Events. You can follow any responses to this entry through the RSS 2.0 feed. Both comments and pings are currently closed.